Raspberry Pi | It`s full of stars! 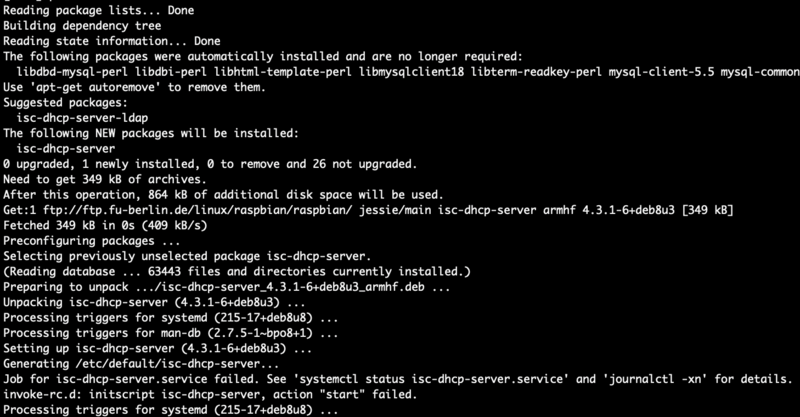 After setting up a DHCP server on a Raspberry Pi running Linux I get working leases for my clients. However, these are not static. 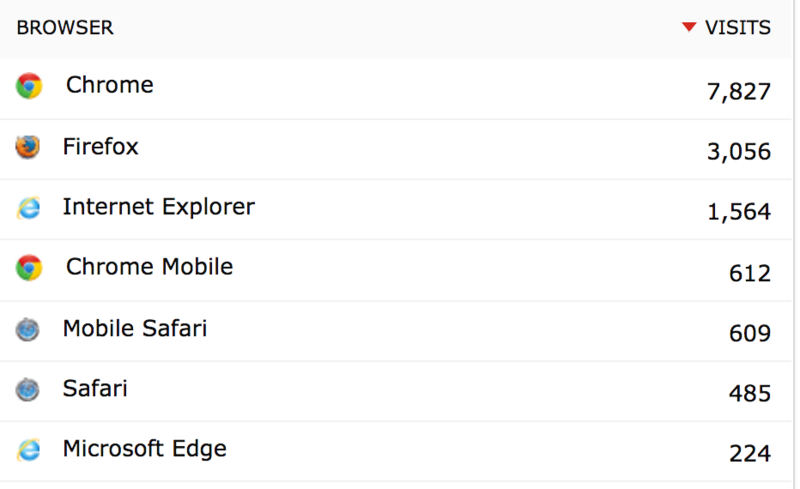 It can happen that my smartphone gets a new IP address the next it connects: 192.168.0.161 instead of 192.168.0.160. 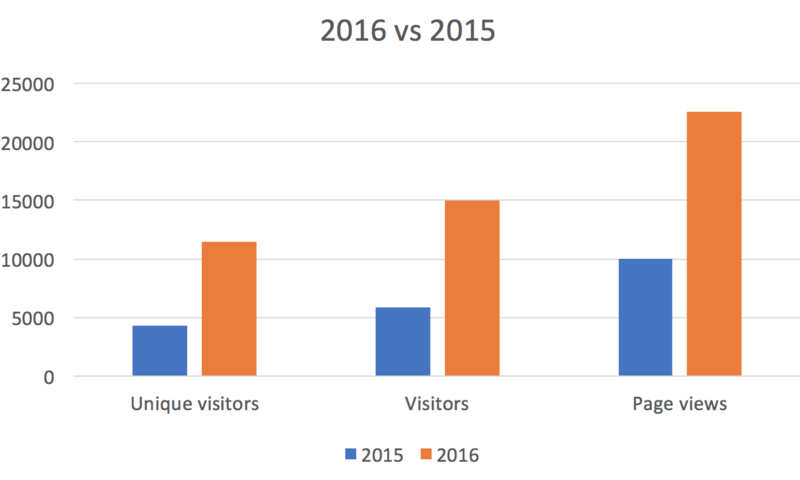 For some clients I want to make sure they always use the same IP. This can achieved with ISC DHCP Server by registering a static lease for a specific MAC. I’ll use my soundbar for the rest of this blog as an example. The MAC of the network card is bc:30:d9:2a:c9:50. I want to always assign the IP 192.168.0.152 to the soundbar. The last line shows that the DHCP server assigned an IP to a client and shows also the MAC address. Let’s make sure the MAC bc:30:d9:2a:c9:50 always gets the IP 192.168.0.152. This is the DHCP server configuration file. I already configured it for a subnet 192.168.0.x where the server is assigning leases for the IP addresses in the range of 192.168.0.150 to 192.168.0.240. Inside the subnet configuration, I have to add a configuration for the soundbar for IP 192.168.0.152. To activate the new configuration, make either DHCPD load the new configuration from file, or restart the service. The assigned leases can be found in the dhcpd.leases file. All leases assigned are listed here, including the mac address, IP address, start and end time of the lease. If all works out as planned, the soundbar will be in there with the static IP. 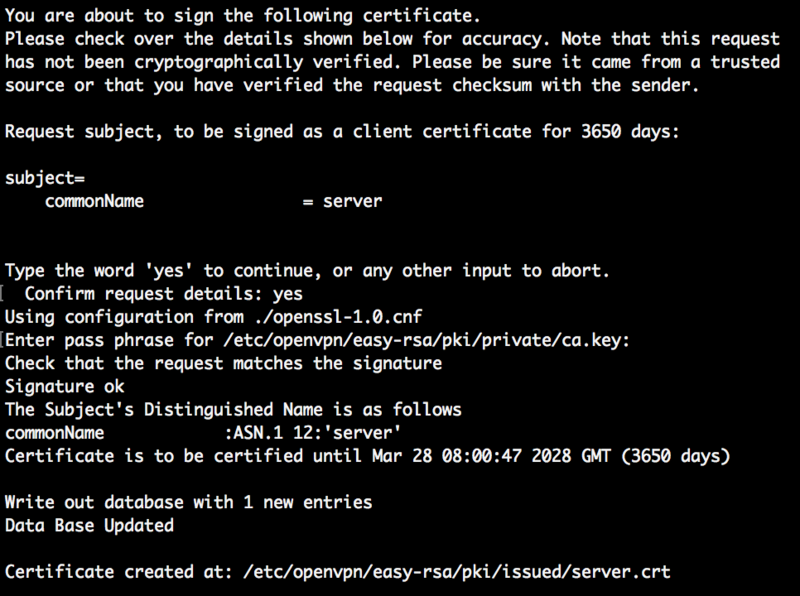 OpenVPN uses certificates to authenticate the server and clients. Therefore, the client needs to have a valid client certificate. This certificate needs to be issued by the CA server that also issued the certificate of the OpenVPN server. In my case, this server is installed together with the OpenVPN server on the AWS EC2 instance. The process to create the client certificate is the same as with the server certificate, only the certificate type must be client, or: TLS Web Client Authentication. This is done by specifying the client parameter in the generate certificate request command. 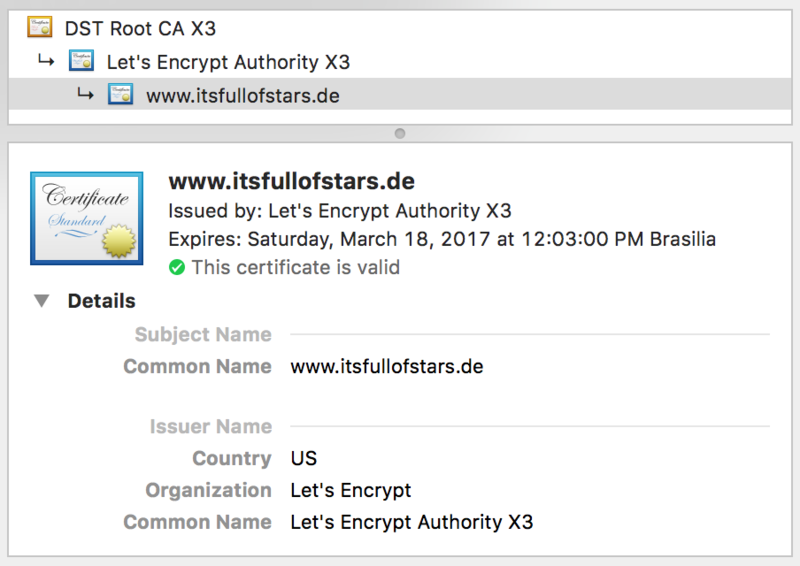 Depending whether or not easy-rsa or any other tool to generate a certificate request is available on the client, the request can be generated directly on the client. The vantage by creating the request on the client is that the private key will stay on the client. In my example, I’ll make use of the already available infrastructure on the OpenVPN server and generate the client request and certificate on the server and copy later the generated artifacts over to the client. 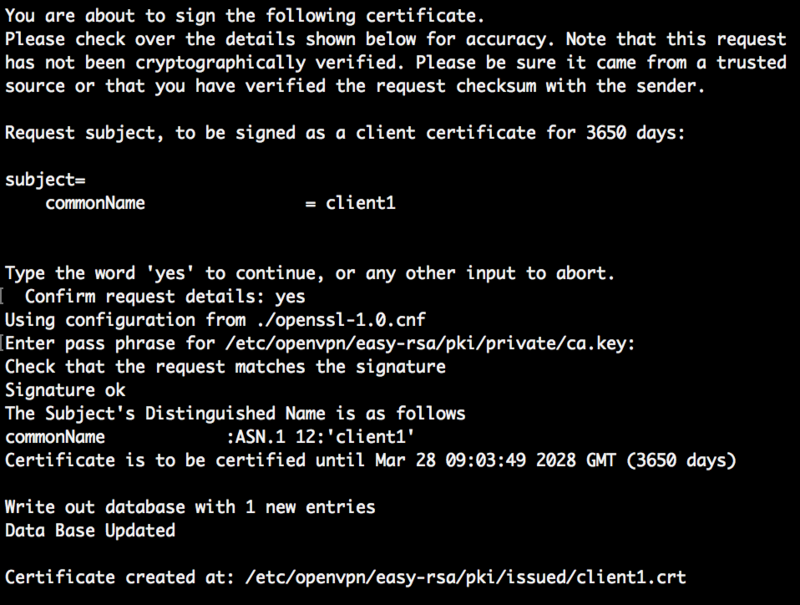 Log in to the CA (OpenVPN) server and issue a client certificate request. The name of the client will be client1. Note that you can use a different name, like the FQDN of the client. 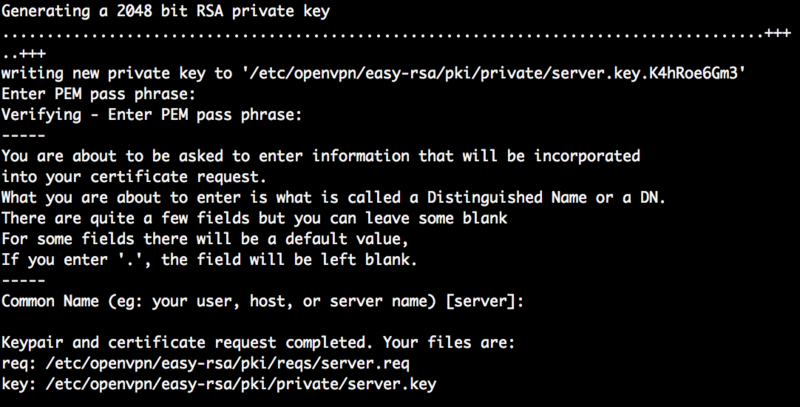 As with the server certificate, give a passphrase and common name. Next: sign the client1 certificate by the CA. You need to confirm the signing request by entering yes and informing the pass phrase of the CA certificate. The client certificate is now issued. Move these files to the OpenVPN client. 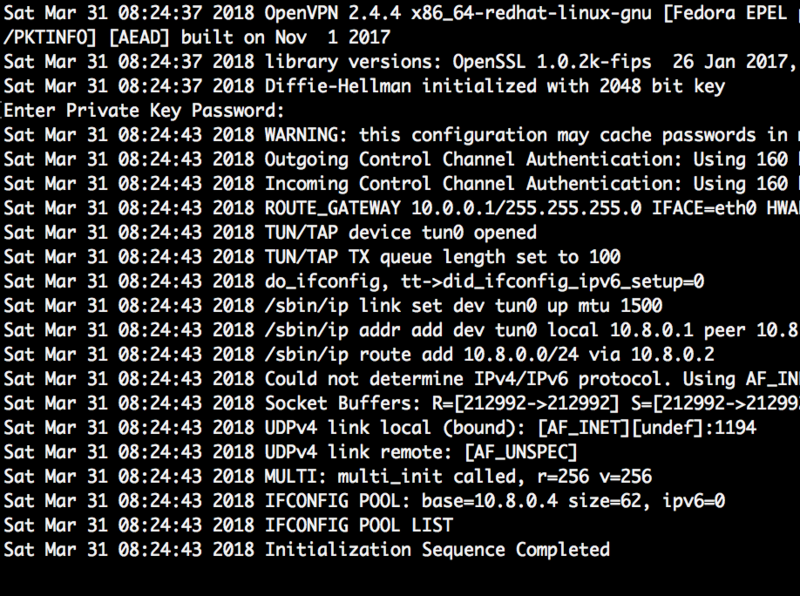 The client going to connect to the OpenVPN server running on AWS EC2 is a Raspberry Pi. The RP uses a Debian based Linux, therefore apt is used to install software. 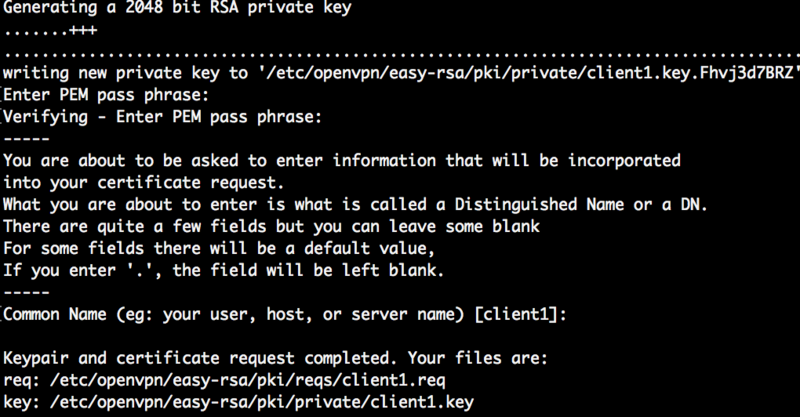 On the RP, install OpenVPN. 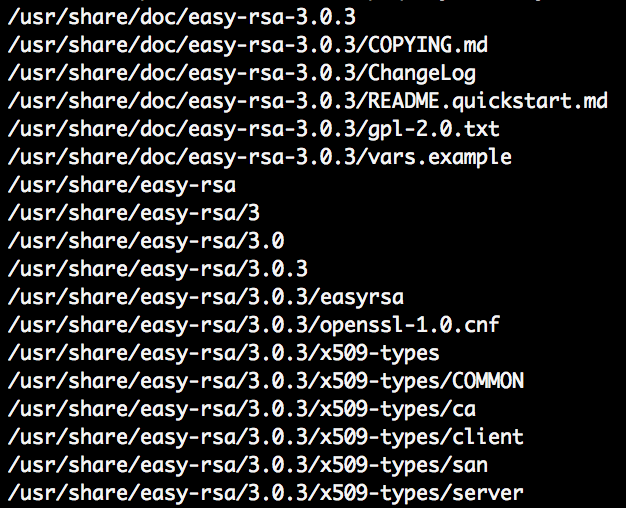 Easy-rsa is not needed, as the CA is running on the EC2 instance. Create a openvpn directory. Can be in /etc/ or in your user’s home. Put the client’s public certificate and privte key there. To use HMCA for additional security, copy the ta.key file from the server there too. 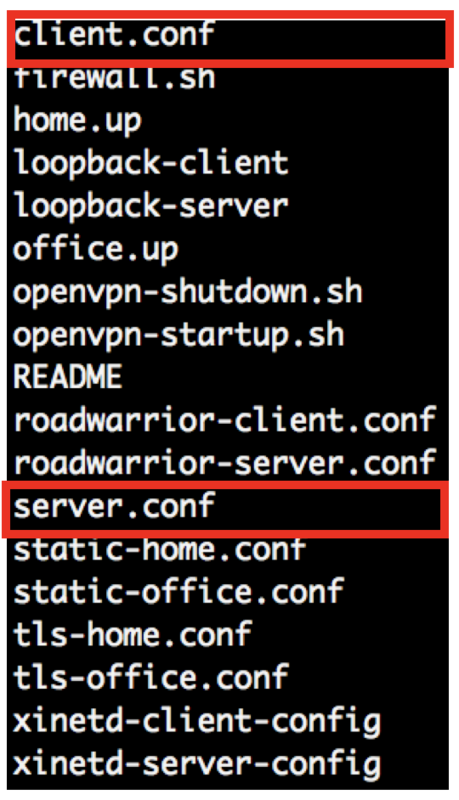 Copy the OpenVPN sample client configuration to your openvpn directory and edit the file client.conf. The tls-auth parameter is needed in case the server is configured to use HCMA. The shared key ta.key from the server is needed for this to work. To start the OpenVPN as client, run the executable and pass the path to the configuration file as parameter. You need to provide the pass phrase of the client1 private key. 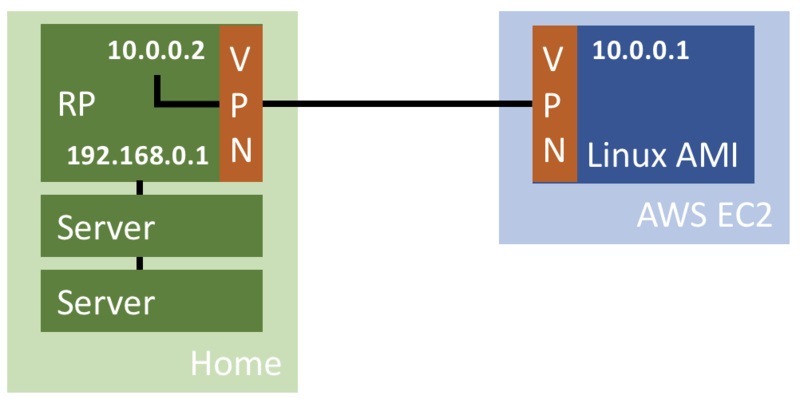 The client will automatically connect to the OpenVPN server defined in the client.conf file (remote parameter) and the given port (1194). Make sure that on AWS EC2, this port is accessible for the client. If all works, the client connects to the server and gets an internal IP assigned.